After Brazil’s presidential elections, the country’s Congress got back to its normal activities, placing an array of conservative topics on the agenda. One of the pieces of legislation that stand out is a Senate bill that describes criminal activities classified as terrorism and could lead to the formal criminalization of people’s movements. The bill now re-emerges as a conservative wave gained momentum and led to the election of Jair Bolsonaro as president, while members of Congress try to reintroduce provisions from the counter-terrorism act that were vetoed by ex-president Dilma Rousseff in 2016, when the bill was signed into law. Back then, the counter-terrorism bill was proposed by the government to meet the demands of international groups aiming to standardize procedures to counter terrorism. Rousseff faced strong opposition from her Workers’ Party’s own supporters, leading her to veto parts of the bill that were passed by the Congress. The Senate bill now placed on the agenda again is sponsored by Lasier Martins and defines interfering with, sabotaging, or damaging computer systems or databases as crimes, punishable with a prison term between 12 and 30 years. Martins argues, among other things, that by vetoing some aspects of the first bill, Rousseff was “poorly informed about the international scenario.” He wrote that the debate over terrorism could not be considered closed and that Brazil may have citizens recruited by terrorist groups that could possibly lead to attacks around the country. On the other hand, the opposition says that, in addition to open the way for criminalizing people’s movements, the bill has loose, inexact definitions, arguing that, while the conducts addressed may have different criminal offense levels, they would be punishable with the same punishment. The initiative would violate, among other things, the principle of proportionality, which aims to balance individual rights and the common good. “The [bill] text is so bad, it actually criminalizes student movements, labor movements. I think this bill alone puts the country in an authoritarian regime, because you take away the right to protest and freedom of association. It’s very serious,” said the leader of the Workers’ Party caucus in the Senate, Lindbergh Farias. As the bill proposes that a defendant convicted for terrorism will serve time in a maximum security prison, the opposition argues that this sentence would violate the principle of individualization of punishment, as it disregards individual conditions, the degree of culpability, criminal record, and other aspects. The senate bill’s rapporteur is senator Magno Malta, who, like Lasier Martins, is a member of the influential rural caucus. He voted to pass the bill and introduced an even tougher amendment, defining “politically, ideologically, or socially motivated activities” as terrorism. Opposition senator Randolfe Rodrigues argues the measure specifically targets organizations such as the Landless Workers’ Movement (MST) and the Homless Workers’ Movement (MTST), as well as other groups known for their struggle. “Clearly, leaders of social movements, like Guilherme Boulos [MTST leader] – whom the president-elect has stated he wanted to see in prison – may be charged with terrorism for organizing a demonstration. This bill is an affront to the Constitution, the freedom of movement, and the freedom to protest, so there is no way it can be passed,” Rodrigues argued. 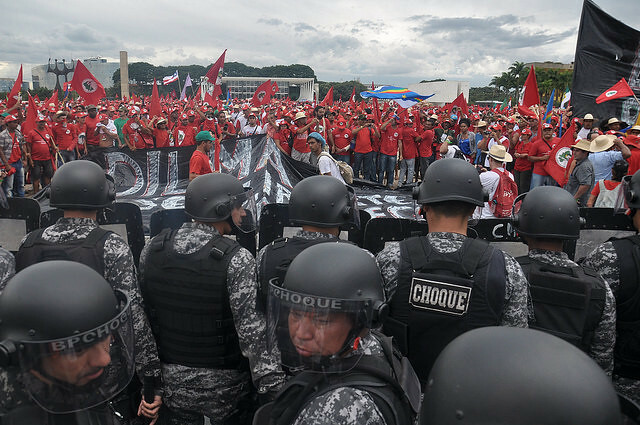 Alexandre Conceição, a member of the national board of the MST, said the bill would mean “an ideological persecution” aimed to eliminate social groups that oppose the neoliberal forces advancing in the economy and conservative forces in politics. “In order to implement a policy like this, they have to destabilize, disorganize, or even stop organized social struggles in this country, which are reflected mostly in the MST and the MTST,” he added. Members of opposition parties have been fighting the rural caucus to prevent the bill from being reported in a Senate committee and managed to call a public hearing to discuss it. The session should take place in two weeks. Their plan is to stall the process as much as possible according to the upper house’s rules. Rodrigues argues that, while conservatives have been gaining momentum, the rural caucus will encounter great resistance to the bill. “With this legislature, I think they will face many difficulties. We will try to stop it from being passed this year. Next year will be different,” he said, adding that the president-elect will be interested in passing the bill. In this year’s elections, the rural caucus, which officially endorsed Bolsonaro’s campaign, did not see most of its members re-elected, as 117 were elected to a new term – 47.7 percent of the 245 members of parliament who are currently part of the lobby. While it is still unclear how many new members of parliament will join the rural caucus as of 2019, conservatives are expanding their presence in the country’s upper and lower houses, especially with caucuses such as Bolsonaro’s far-right Social Liberal Party (PSL). The party had the second largest caucus elected in the Chamber of Deputies, with 52 members, and it could grow even bigger during Bolsonaro’s government, as politicians may change parties. Previous Post Lava Jato|Fascism is a Match. Who’s the Matchmaker?